Dave has posted part 2 of his soldering tutorial. Recommended viewing - even if Dave does say "It just looks like a big mound of turd...I don't know." Last year around mid-November Eric and I (Base2's owners) were in the Denver area and were fortunate enough to be able to visit the circuit board manufacturer that we frequently use - Advanced Circuits. They were kind enough to give us a tour of their facility and explain the manufacturing process every step of the way - and let us take pictures! We'd like the thank Tony, who enthusiastically gave us the tour, and Forest, our sales rep who setup the tour. Advanced circuits has an amazing facility and it was quite an experience to see how the boards we order are made. On with the tour! I came across this Article and thought the people here would find this an interesting read. Andrew “Bunnie” Huang is well known for his Xbox hacks. He wanted to try out some reversing techniques on programmed PIC 18F1320 chips he acquired in order to read the secured FLASH memory. After having the PICs commercially decapped, he analyzed the silicon under an electron microscope revealing the location of security bits relative to the FLASH memory he sought to read. In this tutorial he reveals the further tedious steps he took to complete hacking the PIC 18F1320 to read the memory data. Embedded Lab has another great tutorial, thie one on using the MCP23008 port expander. I've posted about it here before and written a Swordfish module. A microcontroller comes with a limited number of general purpose input and output (GPIO) ports. However, some applications may require more ports than are available on the microcontroller. In such a case, GPIO expanders can be used to increase the I/O capability of the microcontroller. MCP23008 is one such device (manufactured by Microchip Technology) which provides an easy I/O expansion using 2-wire serial interface. 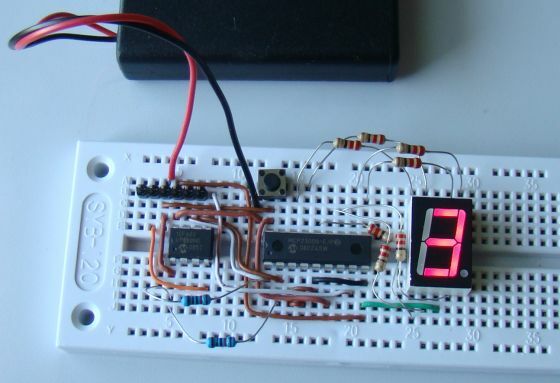 This tutorial illustrates how to add an extra 8-bit I/O port to PIC12683 microcontroller (which has only 6 I/O pins) using MCP23008. A seven segment LED display and a tact switch will be connected to the extended port. The PIC12F683 microcontroller will count the switch presses and display the counter value on the seven segment LED module. On Sunday, my partner Eric and I had a table at the first-ever Kitsap County, Washington Mini Maker Faire, (Maker Faires are sponsored in part by Make Magazine). It was a gloriously nice day for the Seattle area and one of the few nice ones we'd have this year. Over 400 people attended which was a nice scale and allowed lots of time for interaction. We decided that we wanted to present sort of a broad view of "making" - that the technology to go from design to hardware to real-world applications was within everyone's reach. Eric planned to combine "techie" and "foodie" and demonstrate sous-vide cooking as something that "maker" technology makes possible. A number of devices have been decribed on the pages of Digital-DIY that use the I2C interface, including real time clocks, temperature sensors, WII Nunchuks, port expanders and even thermocouple interfaces and a number of Swordfish modules are available to make using these devices simple. The TAP-20-USB board is based around using I2C for expansion. Hack-A-Day posted about this tutorial available on Embedded Labs. It's a nice overview on how to use I2C devices. Have a look. I2C (Inter-Integrated Circuit) is a short distance serial interface that requires only 2 bus lines for data transfer. It was invented by Philips in 1980′s, originally to provide easy on-board communications between a CPU and various peripheral chips in a TV set. Today, it is widely used in varieties of embedded systems to connect low speed peripherals (external EEPROMs, digital sensors, LCD drivers, etc) to the main controller. In this experiment, we will cover an overview of I2C protocol, its implementation in PIC microcontrollers, and the method of connecting single and multiple devices on a common I2C bus. We will demonstrate the technique by connecting two I2C EEPROM chips (24LC512) and an I2C compatible temperature sensor (DS1631) with PIC18F2550 microcontroller. Mighty Ohm Blog: Announcing the “Soldering is Easy” Complete Comic Book! Jeff at the Mighty Ohm Blog has announced the Soldering is Easy Comic board available under a Creative Commons 3.0 ShareAlike/Attribution agreement. Looks like a great reference. This great reference may have been mentioned here before but it's well worth a blog post even if it has been. MikroElektronika has made PIC Microcontrollers by Milan Verle available online free of charge. This 394 page reference covers the nitty-gritty of PIC microcontrollers and provides great insite into what goes on inside. The how and why of hardware functions are clearly explained.